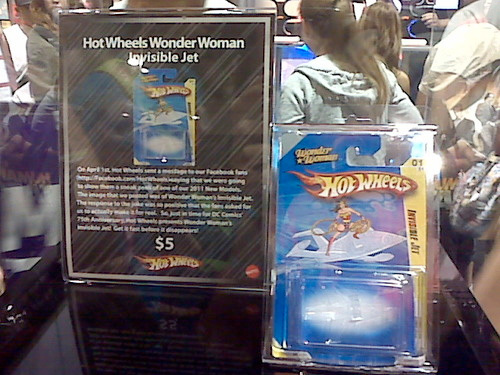 Hot Wheels' Wonder Woman Invisible Jet Now A Comic Con Exclusive | OhGizmo! You can now add Mattel to the list of giant corporations who actually have a sense of humor, or at least, giant corporations who know an easy cash grab when they see one. 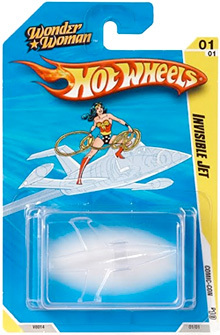 Wonder Woman’s Invisible Jet was originally created as an April Fool’s Day prank, but apparently there was enough demand from fans to have it go into limited production. It was exclusively available at Comic Con for $5 a pop, and by exclusively I of course mean they’re already all over eBay if you want one and didn’t make it out to San Diego for the big show. And if you were wondering, that blister pack is completely empty, not even a clear plastic shell of a plane inside. But it’s definitely a stroke of marketing genius on Mattel’s part because not only are they making a tidy profit on every one, but since they’ve been limited to an exclusive only available at Comic Con, anyone who shelled out $5 will probably see a tidy return in the near future. That is actually pretty neat. If I was collector I'd totally snag one of those. Its always funny though to watch collectors freak out over nothing, and in this case literally nothing but a package. That is one of the most brilliant and hilarious marketing ideas of all time. Kudos! Yeah, I already have a couple of those, unfortunatley I lost the packaging so they're not worth much to collectors now.